Several control systems are used in industrial sectors and applications, including supervisory control and data acquisition systems (SCADA), distributed control systems (DCS), programmable logic controllers (PLC) and programmable automation controllers (PACs). 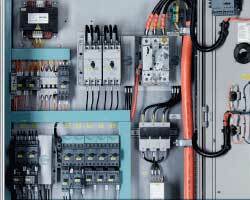 PLCs can be found under their own category and PACs are covered under Programmable Controllers on this site. Industrial controls rely upon the flow of information from remote stations to a control center, from which automated or operator-driven commands can be sent out. Field devices then manage local operations, data collection from sensor systems, and the monitoring of the local environment. DCS (distributed control systems) are control systems gather data and control the systems in a large facility in real time on high-bandwidth, low-latency data networks. SCADA systems gather remote, often geographically separated data through potentially unreliable or intermittent low-bandwidth/high-latency links. SCADA system uses RTUs (remote terminal units) to send supervisory data back to a control center. As each type of industrial control system's limits are surpassed, they are increasingly being fused together to form new kinds of industrial controls.